Bob Carr was a crooked politician. Before he became Australia's Foreign Minister and earlier NSW Premier, he was NSW Planning Minister. 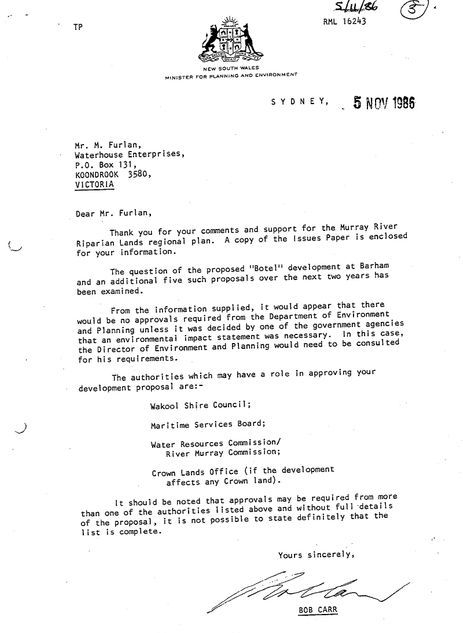 When he signed the letter below he must have known that the Botel was not covered by the NSW Planning and Assessment Act 1975 because his department said so later on. An Environmental Impact Report was called for and it was provided to the agencies. Here is what Bob Carr wrote in 1986. By 1988 there were 13 authorities but the CONSENT authority was the local council. Our substantial "Environmental Impact Statement" silenced all of them. Council asked the Minister to call the project in and relieve them of the responsibility. They called in the crooked politicians.